Ilfochrome (Cibachrome) prints of many images in this discontinued medium are still available. This superlative and uniquely beautiful medium had long been the preferred choice of galleries and museums and is the premier method for optically producing fine art color photographic prints. Always rare because of its legendary difficulty and costly materials, Ilfochrome is increasingly of interest to collectors. The photographer exclusively hand printed Ilfochrome until 2008 when he discontinued its use because of chronic and insurmountable difficulties in procuring the product and its processing chemistry. For more information and prices see Ilfochrome Prints. These are printed by the photographer with Epson Professional Imaging series printers on Epson Exhibition Fiber Paper. This premium paper, made in the U.K. and introduced in late 2007, is a breakthrough product. It provides saturated color and visual acuity not possible with traditional fiber based media. Sharpness, or resolution of fine detail, exceeds that of any other inkjet medium and is comparable to the sharpest optical print media including Ilfochrome. Its extremely high D-Max, minimal gloss differential and a micro porous smooth glossy (F-Type) surface exhibit superior color brilliance, cleaner whites, deeper blacks and a wider color gamut compared to other fine art inkjet papers. This heavyweight paper (325 grams/meter2 and 13 mil thick) is acid and lignin free. In combination with Epson’s UltraChrome K3 (Vivid Magenta) inks it features excellent fade resistance and archival permanence. Heidelberg Primescan drum scans of his original transparencies are adjusted for printing by the photographer. These scans from 35mm film are 300 MB and from 6x7cm medium format are larger. Adjustments to convert a high resolution scan file into an optimum quality print file typically require 30 to 50 hours of Photoshop work. (nominal 11" x 14") image area: 9 3/4" x 13 1/2" – matted to 16" x 20". 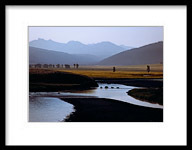 (nominal 16" x 20") image area: 15 3/8" x 19 3/8" – double matted to 22" x 26". * Plus a shipping charge (USPS Priority Mail) of $12.00 for any quantity of standard size prints or $25.00 for any quantityof large size prints in a single order within the Continental U.S. Please inquire about shipping costs to other locations. ** Large prints of images A4, B9, K4, L7, N5, R6, R7, S1, V2, W8, X3, X5 and Y1 are usually in stock for immediate shipment. Please inquire about availability and lead times for other large size prints. These prints have a height-width ratio of 1:1.26 and are therefore less rectangular than standard size prints (1:1.38). Thus, the large prints are necessarily cropped about 9% on the horizontal or long dimension. If requested, a web size JPEG image showing this format will be Emailed. Window mats are Rising 4-ply 100% cotton fiber white museum board with a hinged 2-ply backing of the same material and an additional 3/16" foam board backing. These and all other materials used are acid–free and archival. The original photography is both 35mm and 6x7cm, using primarily Kodachrome 25 Professional and Velvia 50 films. No color filtration was utilized in the original film photography. In scanning, Photoshop imagery adjustments and printing the photographer has endeavored to reproduce as closely as possible what the eye perceived without manipulation or deliberate alteration. Website and all images © Copyright Carter E. Gowl, no use without permission.